Asia Provocateur: BREAKING: Thai police come under attack from Thai "Democrat" Party supporters as they attempt hospital reconnection supply. BREAKING: Thai police come under attack from Thai "Democrat" Party supporters as they attempt hospital reconnection supply. 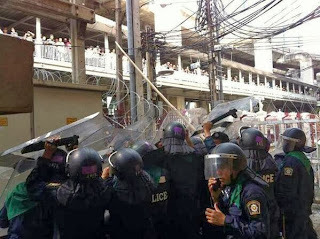 As the story surrounding the Thai Democrat Party's attempts to use their increasingly violent street thugs to take control of Bangkok the cutting of the Bangkok Police Hospital's electricity supply is further evidence of the Democrat's extremism. Yet, cutting off the supply once wasn't enough. The picture below is reported to be of police officers coming under attack from the Democrat Party mob as an attempt was made to reconnect the supply.